Designed by award-winning architect Paul Clarke, this very special house is home-away from home for NZ Fashion icon Robyn Hall. Nestled in a gentle gully on a four-hectare lifestyle block 10 minutes drive from Wanaka. 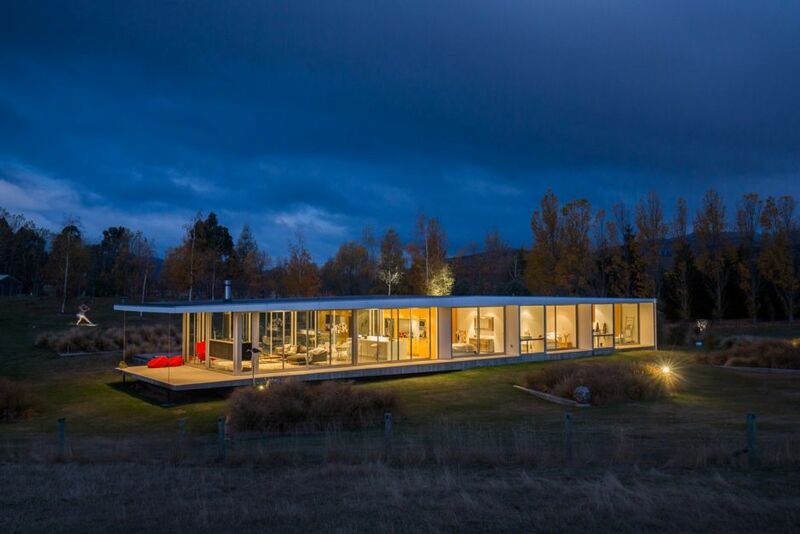 The house takes in 360 degree panoramic views of the surrounding mountains and tussock land, while retaining absolute privacy. This unique home is the perfect hideaway for a ski trip with friends, a family long weekend or base for a Wanaka Wedding or occasion. The perfect entertainers venue, it offers an open plan kitchen with all the tools of the trade; a breakfast bar for casual meals and a large dining table where you can sit and dine while watching the sun set on the mountains. In the summer the floor to ceiling glass walls can be pushed back to allow the outside in, while in winter the house stays cosy and warm with double-glazed glass throughout, underfloor heating and a gas fireplace suspended at one end of the living area. The master bedroom at the opposite end of the house has a stunning Agape bath placed by the window so you can bathe and relax while taking in that very special Central Otago landscape. A breezeway on the eastern side leads to a separate 1 bedroom studio which includes a kitchenette and en suite. From here it is just a couple of meters to the spa, discreetly hidden in the deck area. The property is great for kids big and small - explore the abundant orchard, feed the very friendly Alpacas and discover the outdoor sculptures placed discreetly around the grounds. The owner is a supporter of NZ art and this is evident inside and out. Works by Jeff Thompson, Martin Hill and Hannah Kidd to name a few. ''We have had the best time in this beautiful house. Two small families have loved the Alpacas, the spa, the space and the heavenly views. The house is divine and we felt really privileged to stay here. It has nourished our souls. We really hope to be back next year'. 07/08/16 The Solaris and The Nicholson's. Guest numbers not to exceed those arranged with Property manager. Beautiful location 10 minutes out of Wanaka. Beautiful location 10 minutes out of Wanaka. We loved our stay- we arrived to find some locally made chocolates and a fresh fruit bowl left for us, instructions on how to visit and feed the alpacas and a beautifully appointed home. The house and property are second to done. The house and property are second to done. So well appointed, it meet every requirement.